There have been recent proposals to expand the US Department of Housing and Urban Development's definition of homeless to include households that are doubled up for economic reasons. 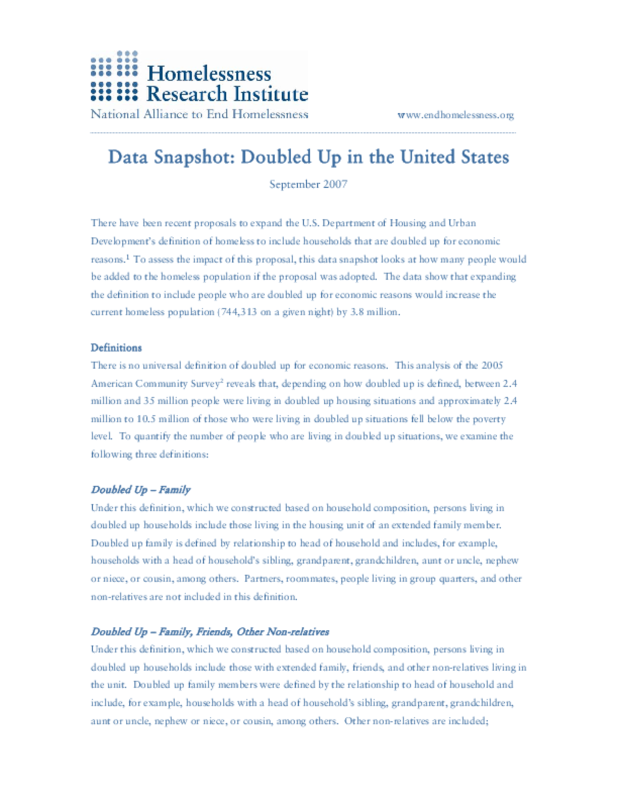 To assess the impact of this proposal, a new data snapshot from the Homelessness Research Institute at the Alliance looks at how many people would be added to the homelessness population if the proposal were adopted. The data snapshot shows that expanding the definition would increase the current homeless population (744,313 on any given night) by 3.8 million. The amount that would have to be appropriated so that the amount of funding per homeless or doubled up person matched the actual amount of funding per homeless person in 2005 is $7.725 billion.